Posted March 31, 2011 in Uncategorized. 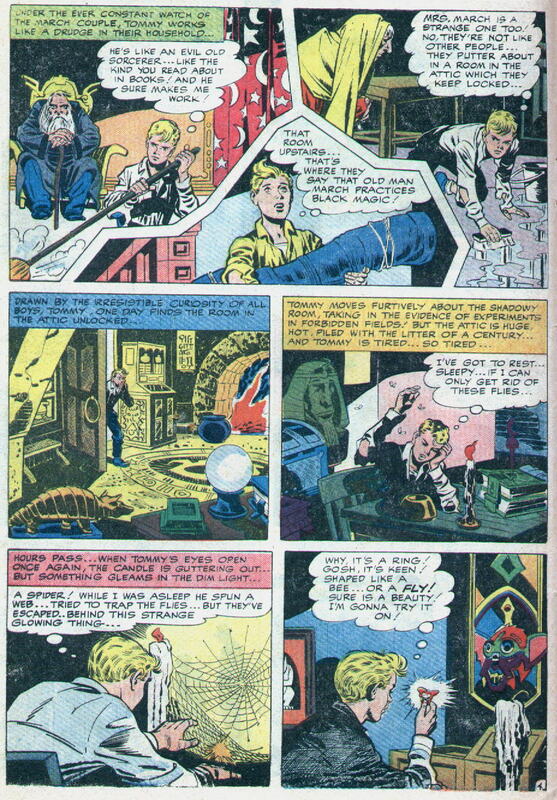 Art from Adventure Comics# 72 (Mar 1942), featuring the Sandman. 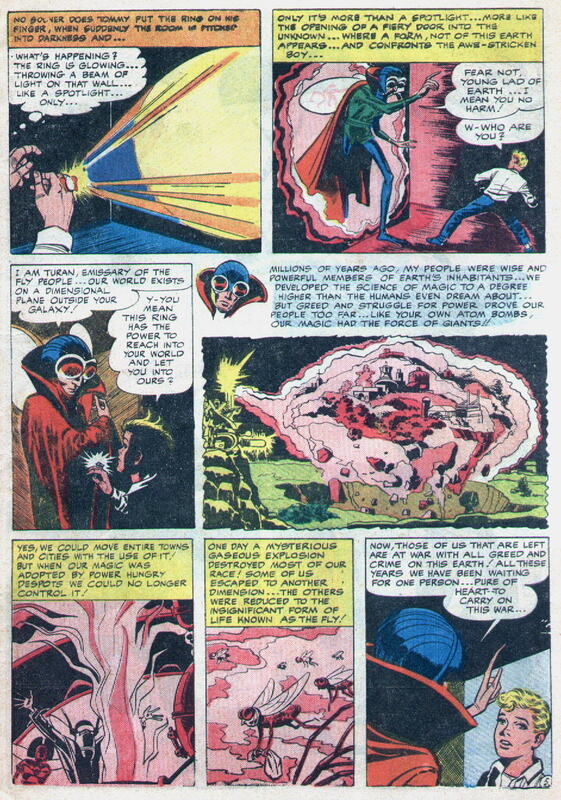 This is Kirby and Simon’s first published work for DC comics. 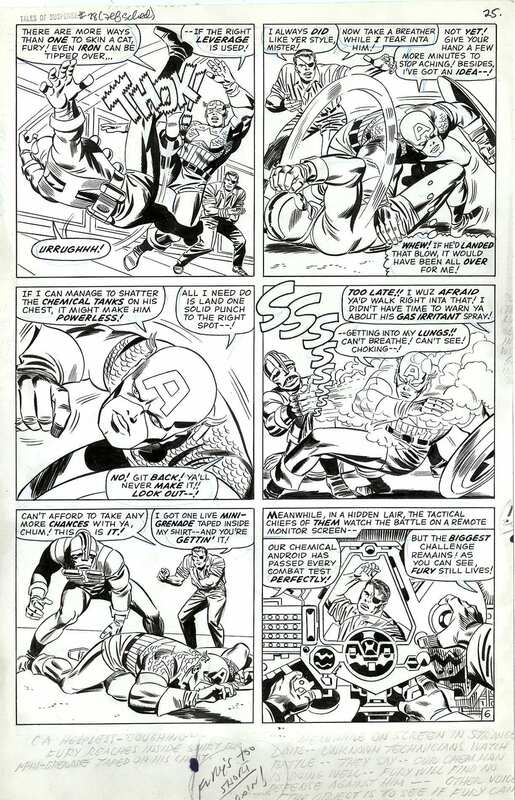 This isn’t a very good scan, in the future I’d like to get some higher quality copies of a lot of the Simon/Kirby material, but here you can still see a nice example of how Kirby action flowed from panel to panel. Posted March 30, 2011 in Uncategorized. If look closely at the pencil photocopy artwork I posted yesterday, you can see the character Non-Fat appears to have African American features in the original pencils; in the published version the character has been changed to look more like a Caucasian. 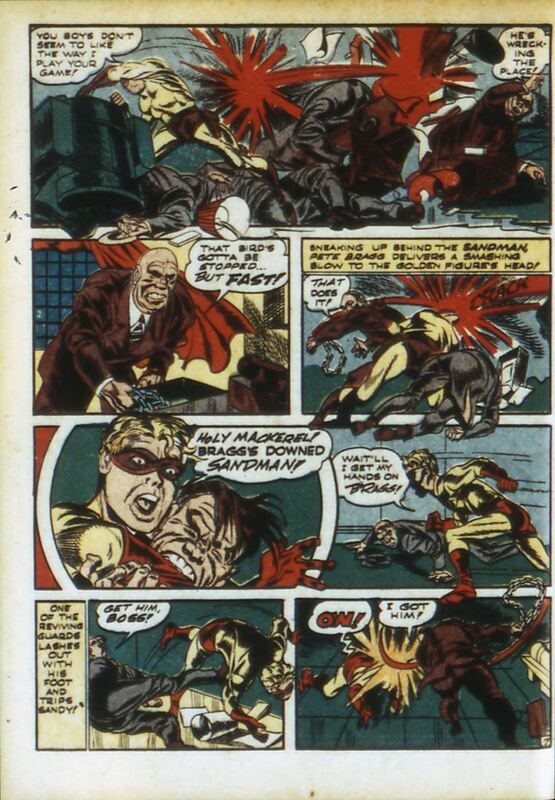 I doubt this was Royer’s decision; the change was probably made at the DC offices. 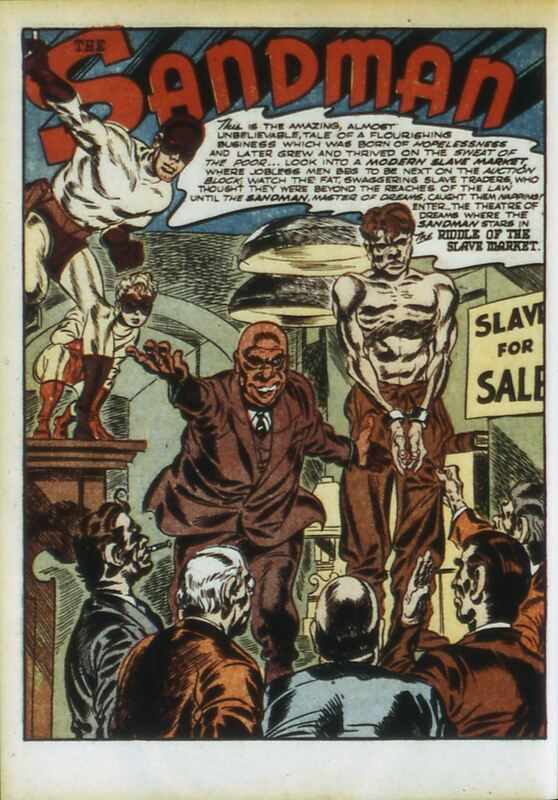 40 years later artists still have to be careful when portraying characters from different ethnic backgrounds or they could face accusations of stereotyping or racism, so you have to think someone at DC figured it was a good idea to simply avoid any controversy altogether by changing the character’s ethnicity. Mainly the piece is interesting from the perspective that once again it appears Jack was trying to promote diversity in his stories. 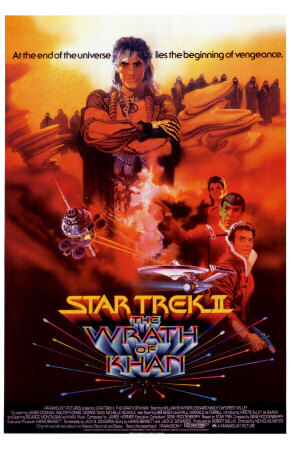 If anyone has a scan of the original artwork we can zoom in and see if there is any white-out on that section of the art — I guess “white-out” taking on an added level of irony in this instance. Posted March 29, 2011 in Uncategorized. 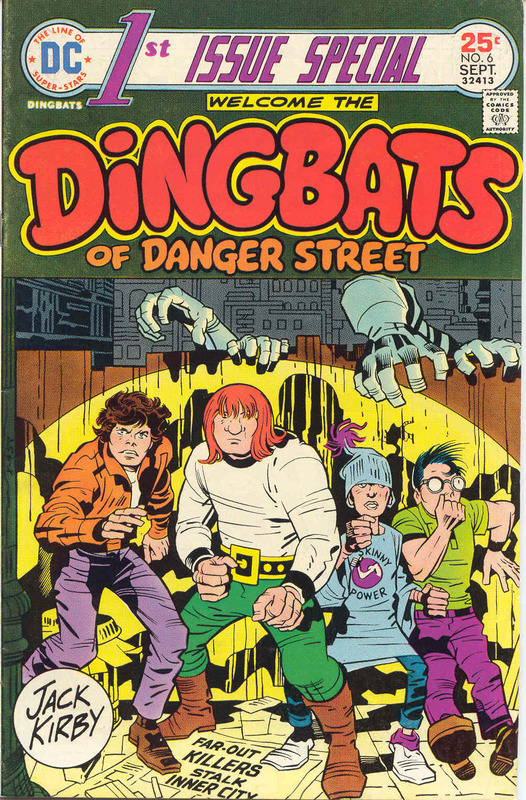 One of Jack’s more bizarre creations, his version of a 1970s kid gang, The Dingbats of Danger Street, from First Issue Special # 6 (Sep 1975). Here is a photocopy of Jack’s uninked pencils of the cover. 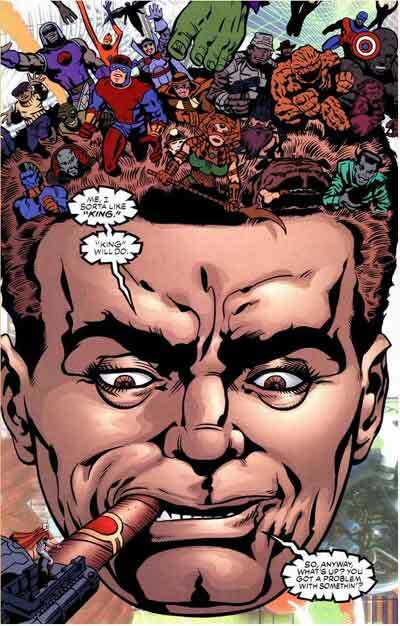 Jack’s text at the top of the page says: “Dregs of society? 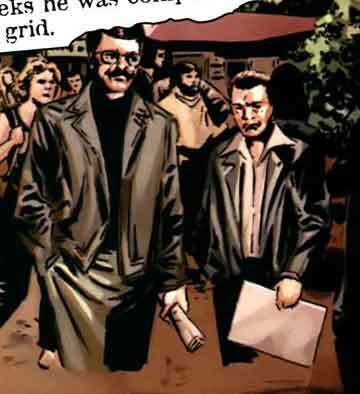 — Or heroes of inner city? 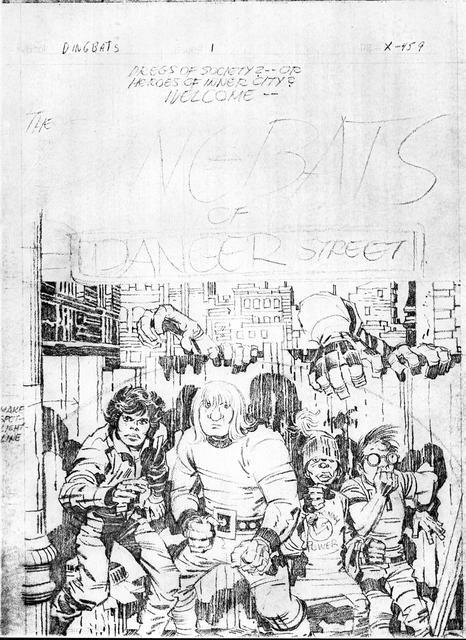 Welcome — the Dingbats of Danger Street.” I assume it was Mike Royer’s decision what to include or not include in the inking phase. Note also “Danger Street” was originally written on a street sign. Other than those minor technical details, Royer is still very faithful to Jack’s original design. Posted March 28, 2011 in Uncategorized. 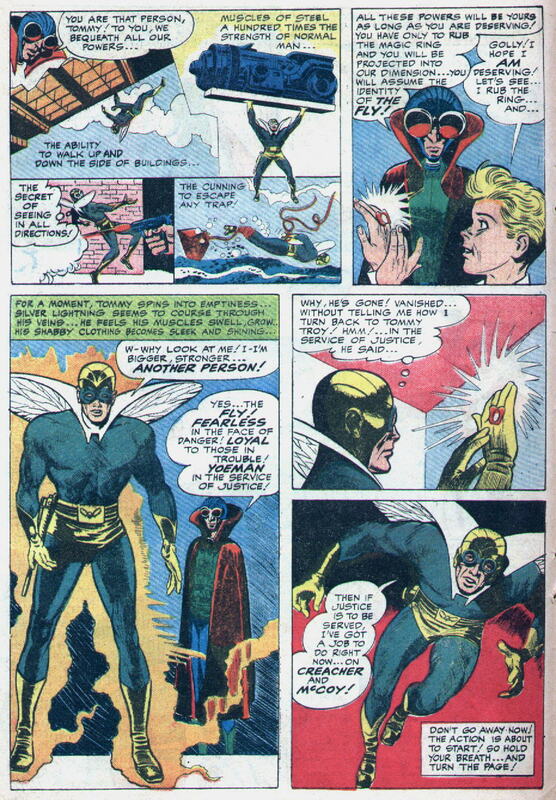 The origin sequence from Adventures of The Fly # 1 (Aug 1959). Pages 4, 5, and 6. Posted March 27, 2011 in Uncategorized. 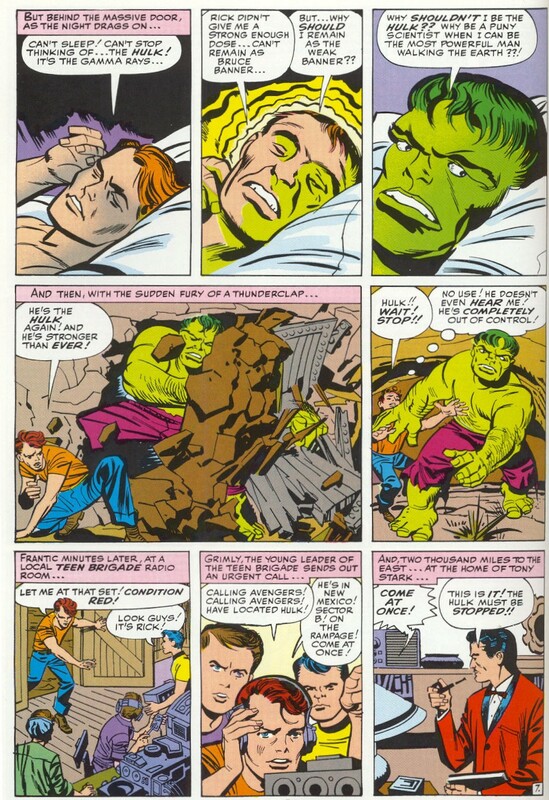 Avengers # 3 (Jan 1964), Page 8. Below that, you can see the original artwork, inked by George Roussos. 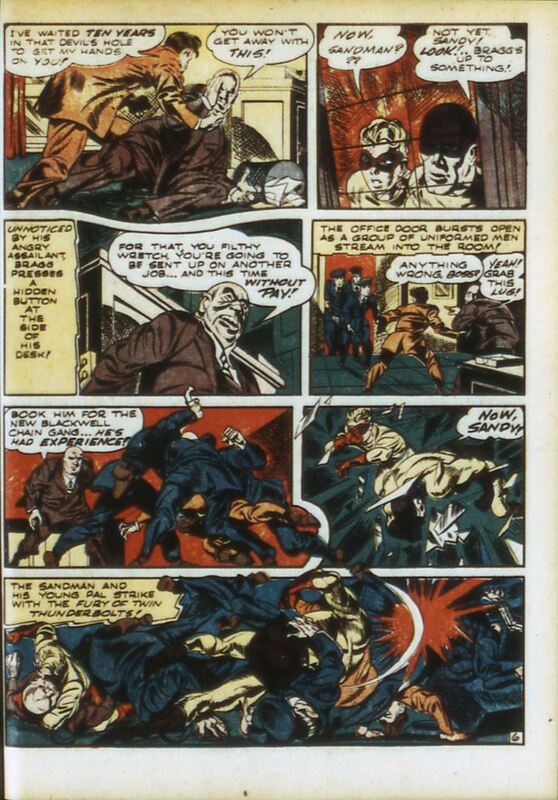 I’m not sure why this page is labelled page 8 on the margins of the original artwork, because you can see it’s listed as page 7 in the right-hand corner of the art, and that’s where it appears in the story. 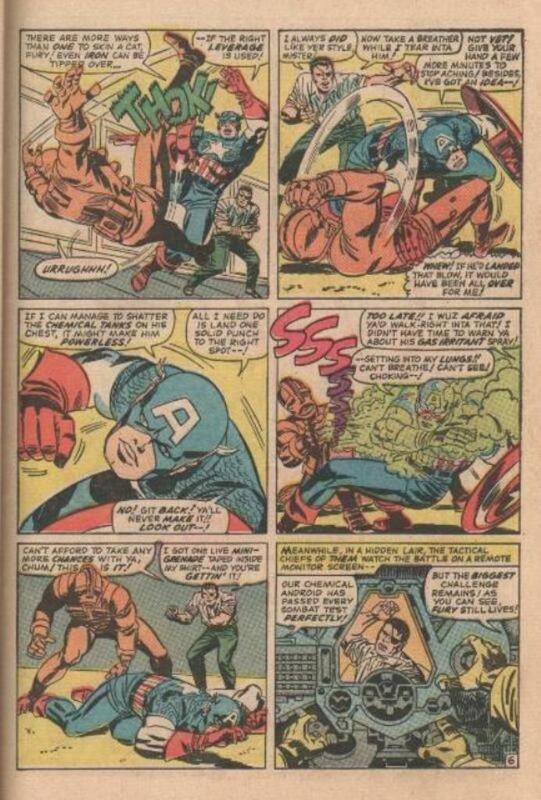 Maybe this was originally page 8 and Stan Lee eliminated a page. 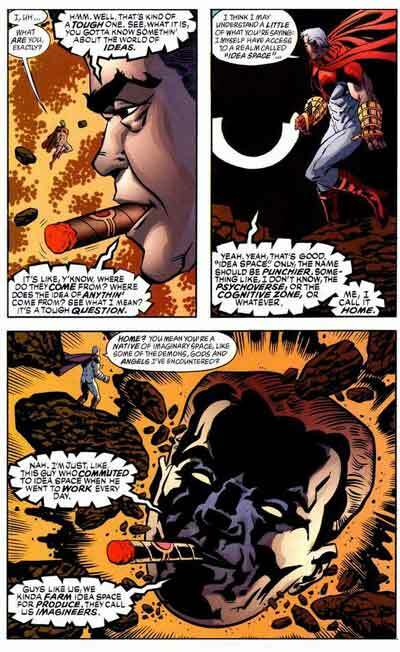 Over the years there’s been much speculation and controversy surrounding the Kirby/Lee working method. 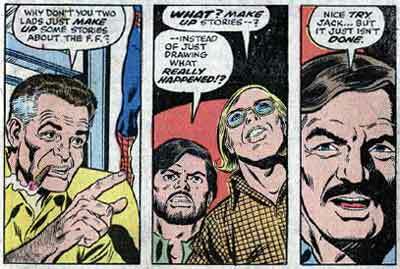 Apparently Lee never gave Jack a script, so it was Kirby’s responsibility to write the bulk of the stories using visuals. 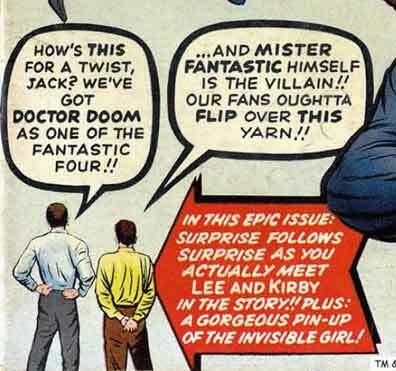 So the question becomes: how did Kirby communicate certain details to Stan Lee? 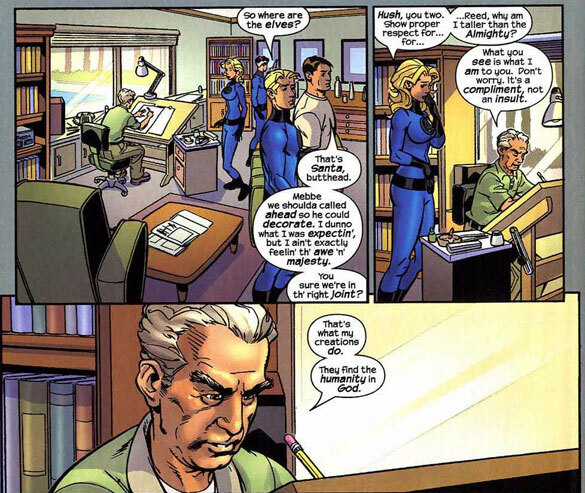 In my opinion, I suspect Jack would meet with Lee probably in Lee’s office, then Jack would show him the artwork, and quickly verbally go through the story with Lee. 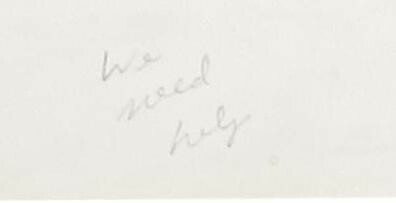 I think that is why you frequently see small notes in Stan Lee’s handwriting from 1960 – 1963 concerning character dialogue, scribbled on the margins of the original artwork. 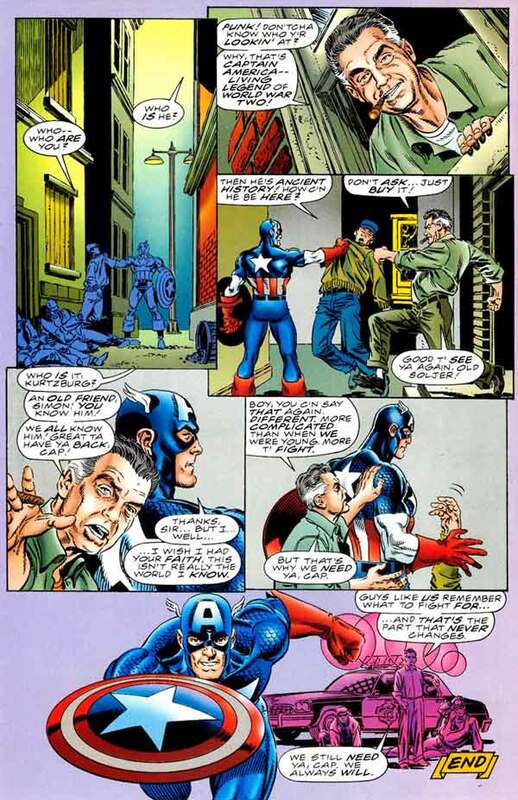 My guess is that Jack explained this page to Lee, and during that process Lee quickly made this note to himself — as you can see looking at the artwork that note nicely sums up the panel above it (panel 6). 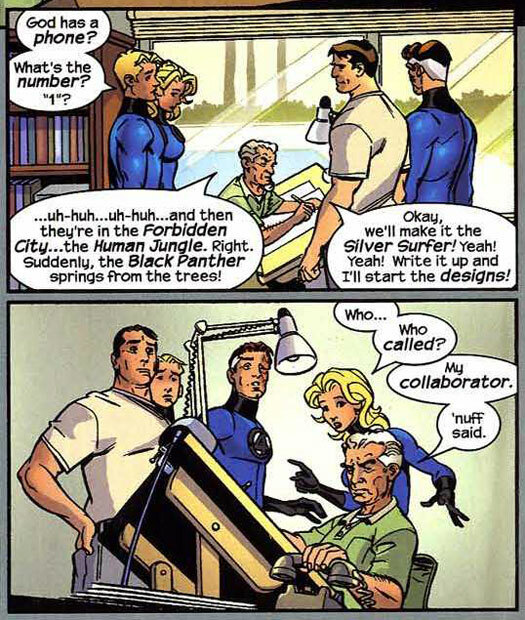 This would have made it easier for Lee to dialogue the book later because he would have these little sign-posts to help him remember what Jack intended to take place in certain panels or sequences of the illustrated story. 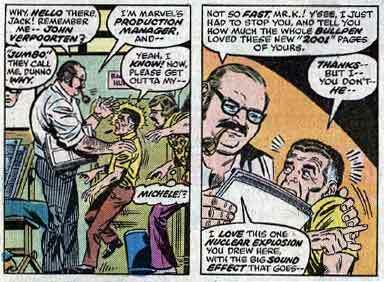 This note below panel 7 appears to be a note to Sol Brodsky: “Fix boy’s hair.” Stan seems to think something is wrong with the hair on one character. 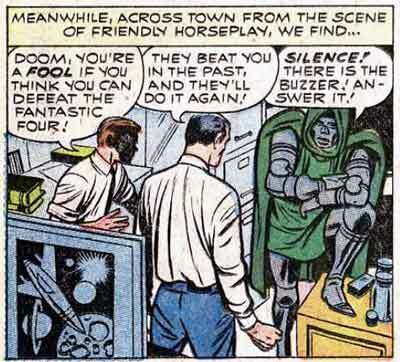 He is also is making it clear he wants the tails of the word balloons to point at the central character. Note this text is larger and in all-caps, easier for a production assistant to read. 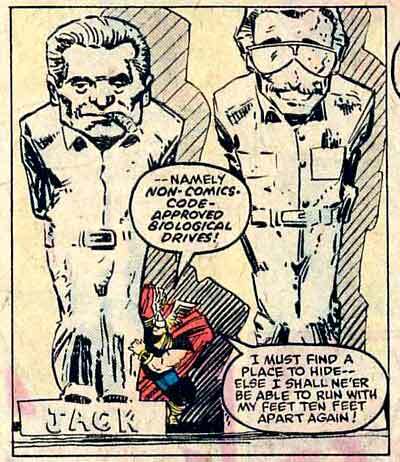 You can also see Jack signed this page, so in all likelihood this was one of the books returned to Jack in the 1980s when Marvel returned 2/5 of his original artwork. Posted March 26, 2011 in Uncategorized. Sad to say my Grandmother passed away yesterday. She was born 4 years after Jack in 1921. She had a great life. 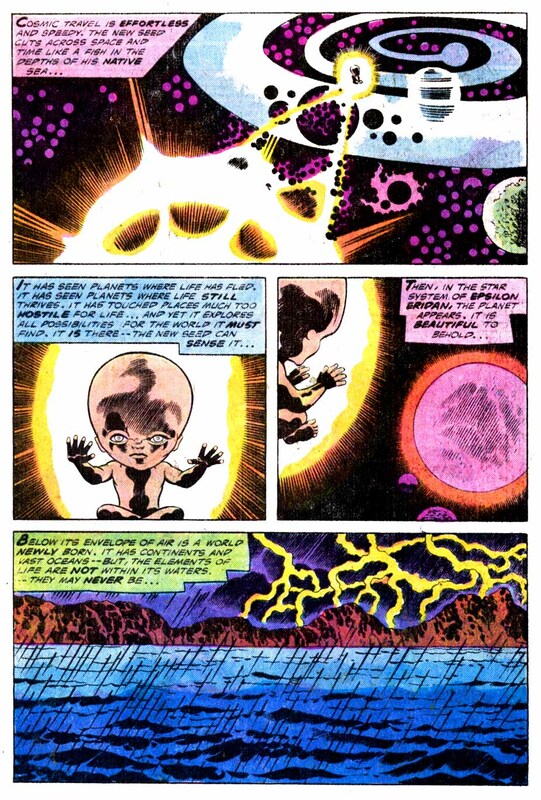 I thought I’d post these last 3 pages from Jack’s 2001: A Space Odyssey comic # 7 (Jun 1977) in her honor where Jack gives you a pretty optimistic look at regeneration and cosmic transformation. 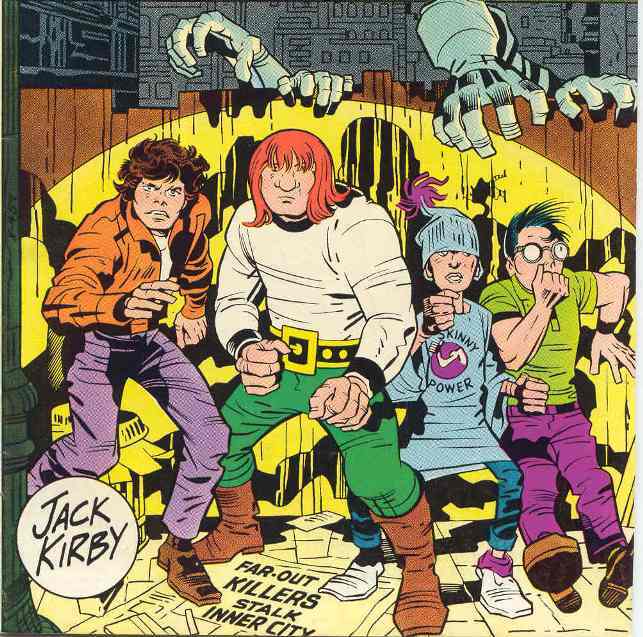 I probably read my stack of Kirby 2001 comics sitting on my Grandparents’ couch back in the 70s. 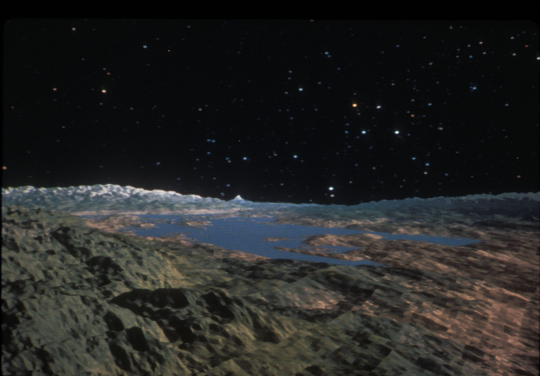 The concept of planting the cosmic seed in the oceans of a lifeless planet is similar to the plot element of the Genesis Device in the second Star Trek film. 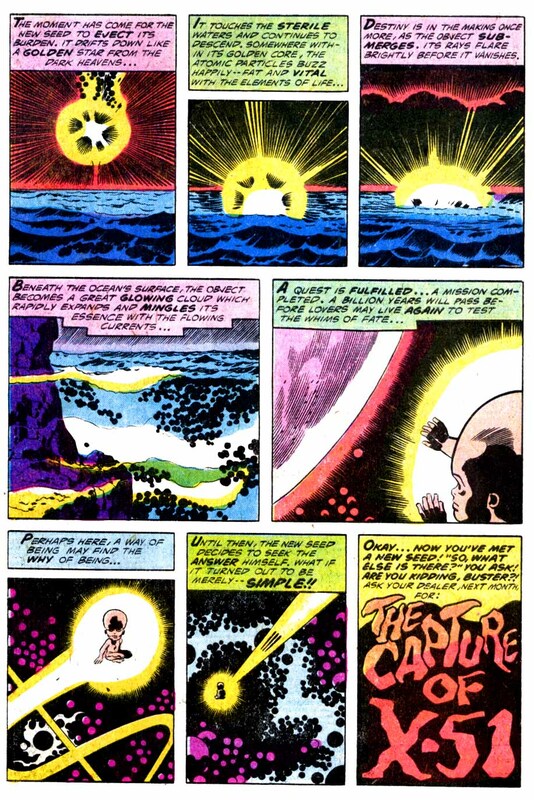 I assume this motif must appear in other science-fiction material that predates Jack’s use of the theme, but certainly Kirby’s work may have been an influence on the Star Trek filmmakers. Posted March 25, 2011 in Uncategorized. 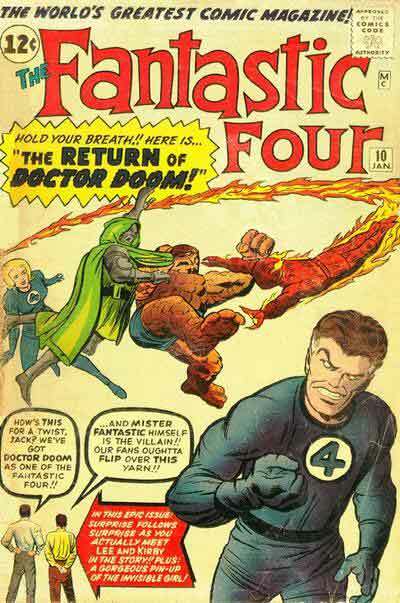 Lot of great Kirby homage material. I pulled a few examples. 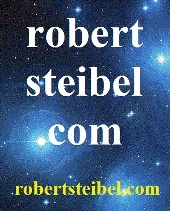 If you want to know the source, check out the website. Posted March 24, 2011 in Uncategorized. Posted March 23, 2011 in Uncategorized. 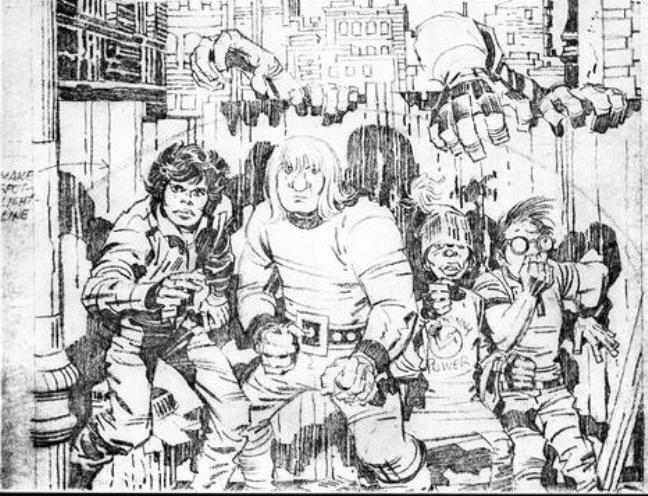 Here’s a scan of that image. If Jack did pencil this, Romita really stamped his own style onto this piece. Apparently Jack did some more work for the interior of this calendar. If any of you have a scan, please send it in and I’ll post it here. 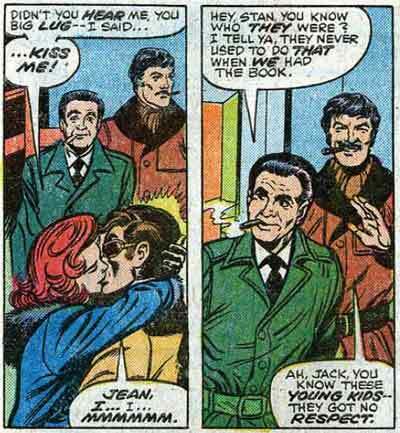 Thanks again to Richard for the heads up, I’d never seen this before and probably would have assumed this was by Romita. Posted March 22, 2011 in Uncategorized. 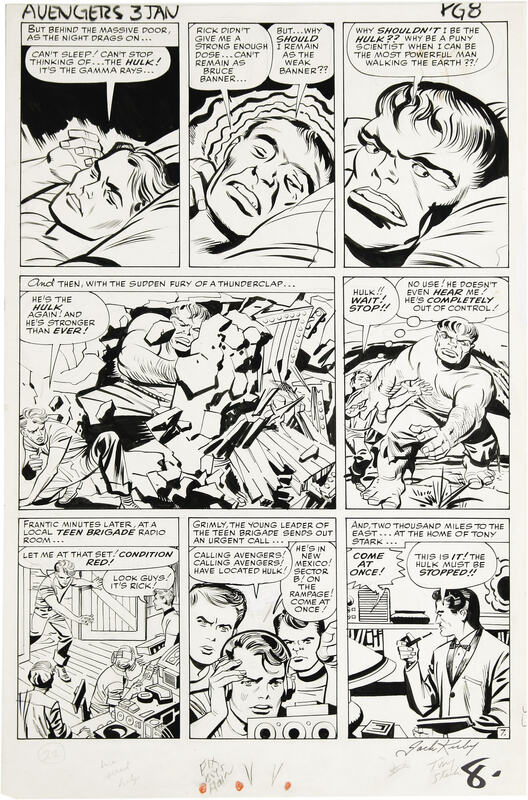 Original artwork from Tales of Suspense # 78 (Jun 1966). 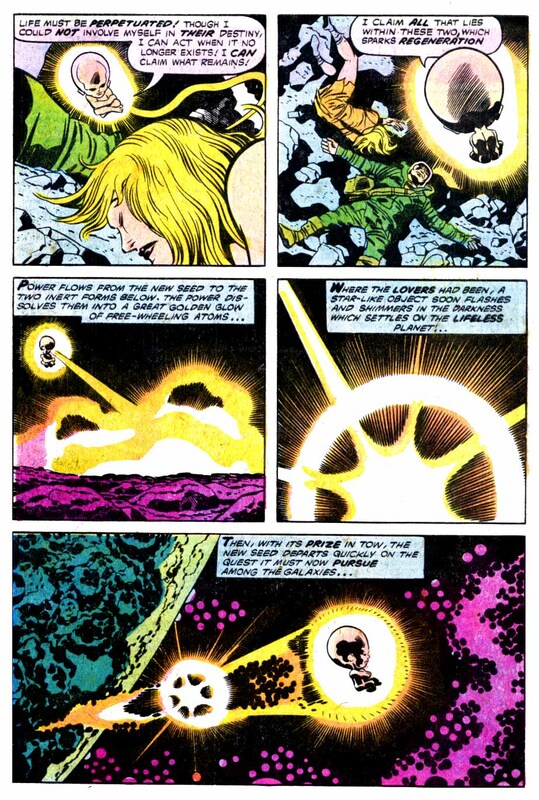 Kirby/Giacoia.